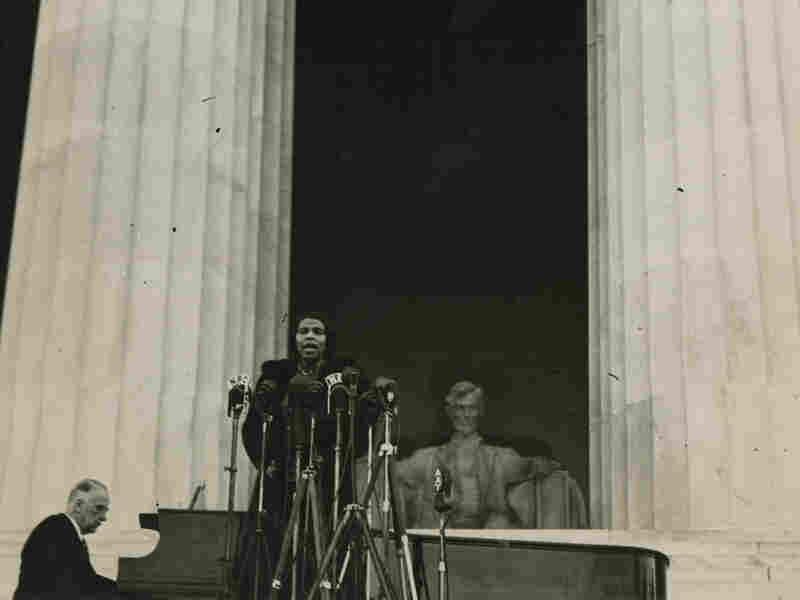 Denied A Stage, She Sang For A Nation Seventy-five years ago, Marian Anderson made history when she sang to crowd of 75,000 at the Lincoln Memorial. The Daughters of the American Revolution had denied her the use of Constitution Hall. 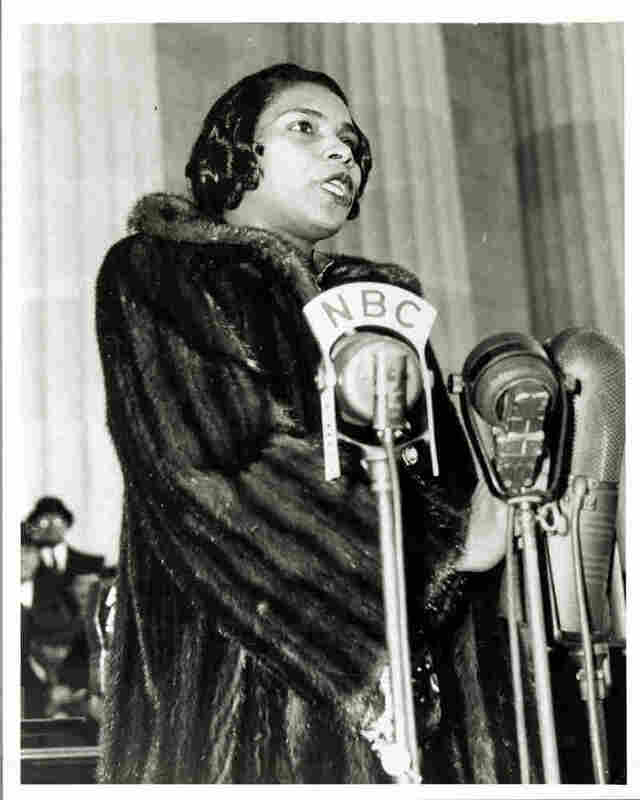 On April 9, 1939, contralto Marian Anderson sang before an audience of 75,000 people gathered at the Lincoln Memorial in Washington. The outdoor location was chosen because Constitution Hall, which was owned by the Daughters of the American Revolution, refused to host Anderson owing to the color of her skin. 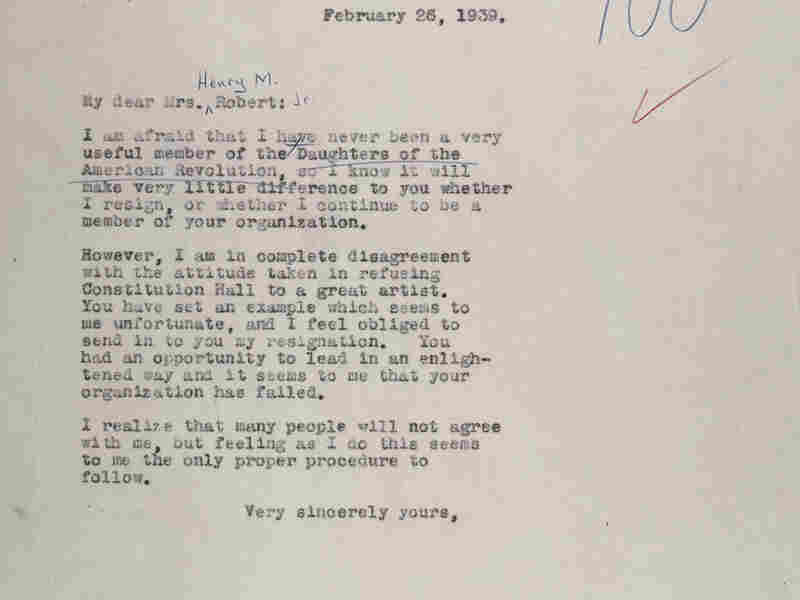 Eleanor Roosevelt, in protest of the decision to refuse Anderson's admission to Constitution Hall, resigned her membership in the Daughters of the American Revolution with this Feb. 26, 1939, letter to Mrs. Henry Roberts. The Lincoln Memorial's tall columns perfectly framed Anderson's majestic voice — a voice conductor Arturo Toscanini said only came around once in a century. 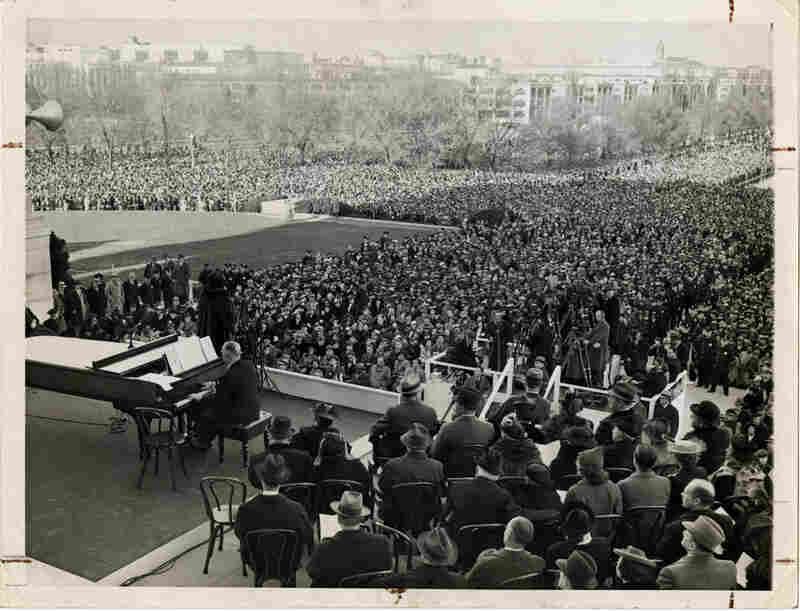 Interior Secretary Harold Ickes facilitated the concert and introduced Anderson, saying: "In this great auditorium under the sky, all of us are free. Genius, like justice, is blind. Genius draws no color lines." Anderson began the concert, which was broadcast by NBC radio, with "America," a deeply patriotic song. When she got to the third line of that well-known tune, she made a change: Instead of singing "of thee I sing" she sang "of thee we sing." 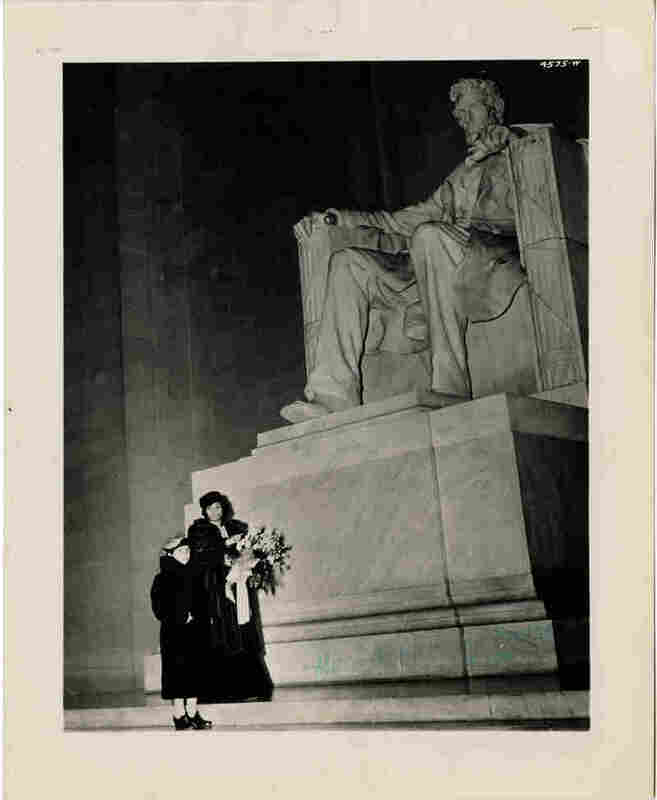 Anderson and her mother, Anna Anderson, at the Lincoln Memorial, April 9, 1939. 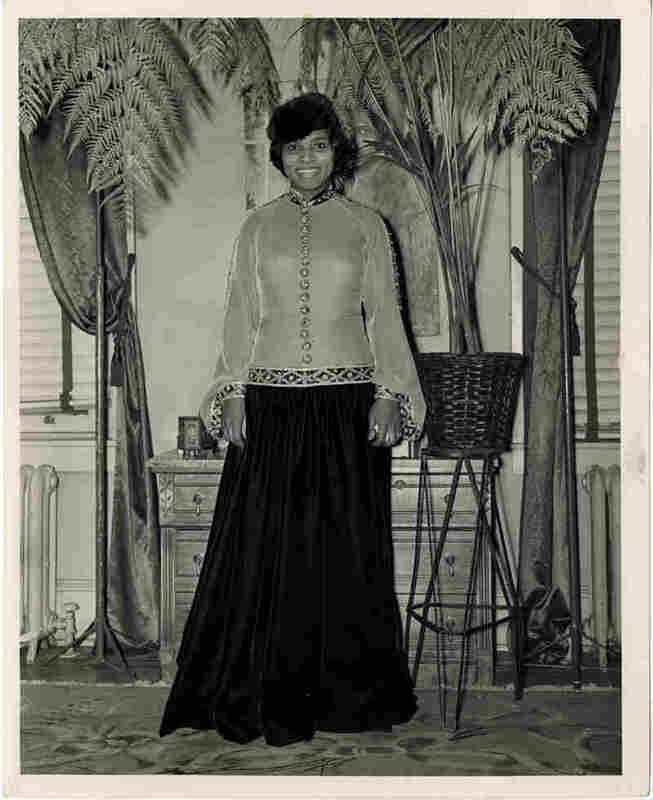 Anderson in the outfit she wore for her historic 1939 concert. 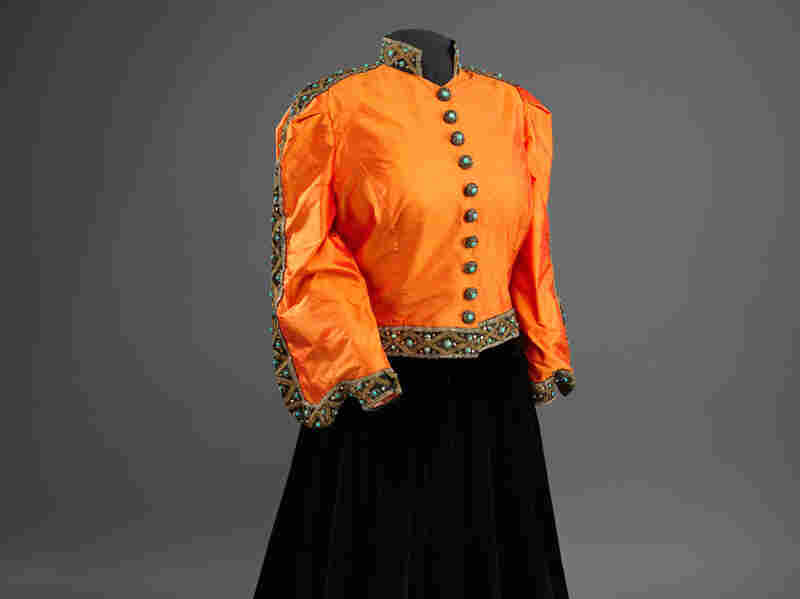 The outfit, a shantung silk blouse and black silk velvet skirt, is now part of the collection of the National Museum of African American History and Culture in Washington. It was a gift from Ginette DePreist in memory of her husband, the conductor James DePreist, Anderson's nephew. Over the outfit she wore for her April 9 concert, Anderson kept the chill April air away with a mink coat. It is now in the collections at the Smithsonian's Anacostia Community Museum, where registrar Habeebah Muhammad displayed the coat for NPR's Susan Stamberg. 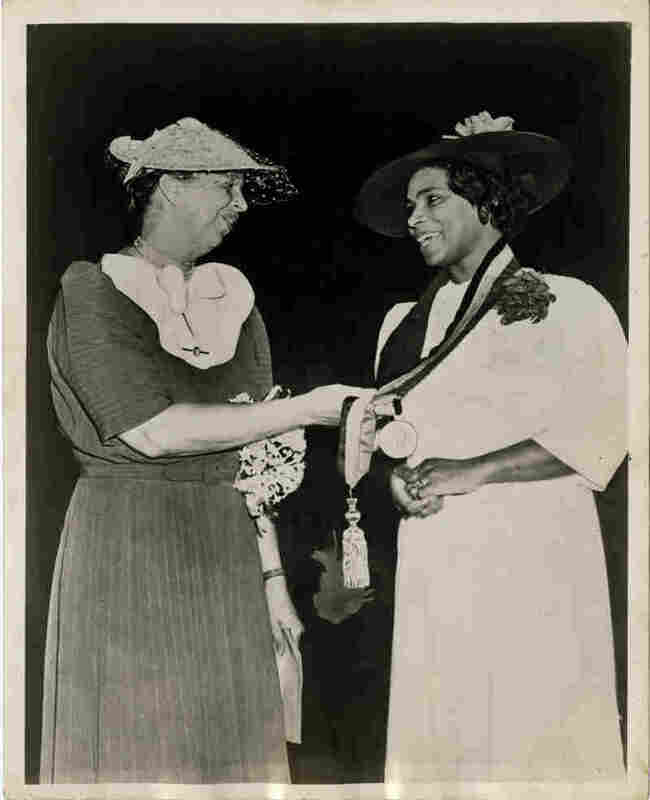 Later in 1939, Eleanor Roosevelt presented Anderson with the Springarn Medal, an annual award given by the NAACP for outstanding achievement by an African-American. 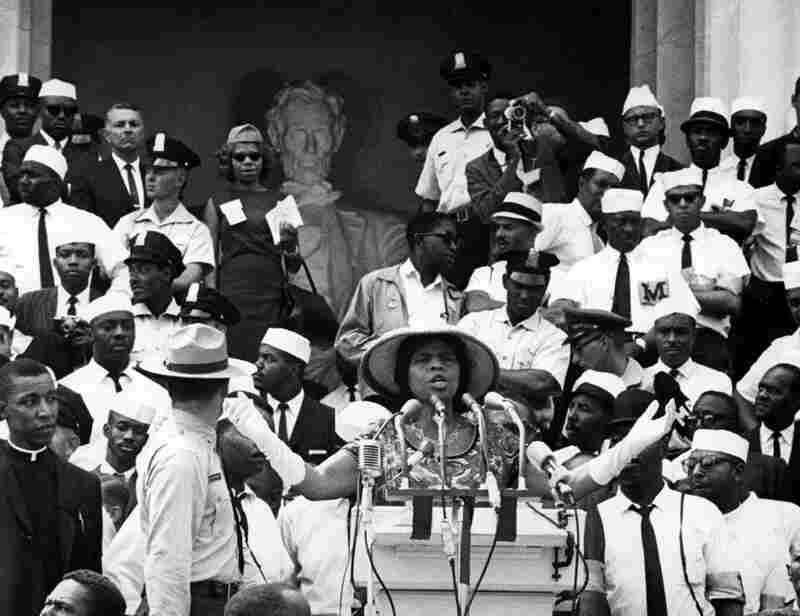 On Aug. 28, 1963, during the March on Washington, Marian Anderson returned to the Lincoln Memorial to sing for an even larger crowd. At 42, contralto Marian Anderson was famous in Europe and the U.S., but she had never faced such an enormous crowd. There were 75,000 people in the audience that day, and she was terrified. Later, she wrote: "I could not run away from this situation. If I had anything to offer, I would have to do so now." I could not run away from this situation. If I had anything to offer, I would have to do so now. "They refused to allow her use of the hall," Keiler says, "because she was black and because there was a white-artist-only clause printed in every contract issued by the DAR." But her change of lyric — from "I" to "we" — can be heard as an embrace, implying community and group responsibility. Never a civil rights activist, Anderson believed prejudice would disappear if she performed and behaved with dignity. But dignity came at a price throughout her 25-minute Lincoln Memorial concert. Biographer Keller says she appeared frightened before every song, yet the perfect notes kept coming. "I think it was because she was able to close her eyes and shut out what she saw in front of her," Keiler says. "And simply the music took over." After "America," she sang an aria from La favorite by Gaetano Donizetti, then Franz Schubert's "Ave Maria." She ended the concert with three spirituals, "Gospel Train," "Trampin'" and "My Soul is Anchored in the Lord." On that stage, before a bank of microphones, the Lincoln statue looming behind her, iconic photographs reveal Anderson as a regal figure that cloudy, blustery day. Although the sun broke out as she began to sing, she wrapped her fur coat around her against the April wind. Anderson's mink coat is preserved at the Anacostia Community Museum in Washington. It's kept in a large archival box in cold storage and stuffed with acid-free tissue to preserve its shape. The lining of the coat is embroidered with gold threads in a paisley pattern, and the initials M A are monogrammed inside. Whether wrapped in that coat or gowned for a concert hall, Anderson, Museum historian Gail Lowe says, touched everyone who heard her: "Her voice was a very rich contralto and so those kind of low notes ... can resonate and match one's heartbeat." Conductor Arturo Toscanini said a voice like Anderson's "comes around once in a hundred years." 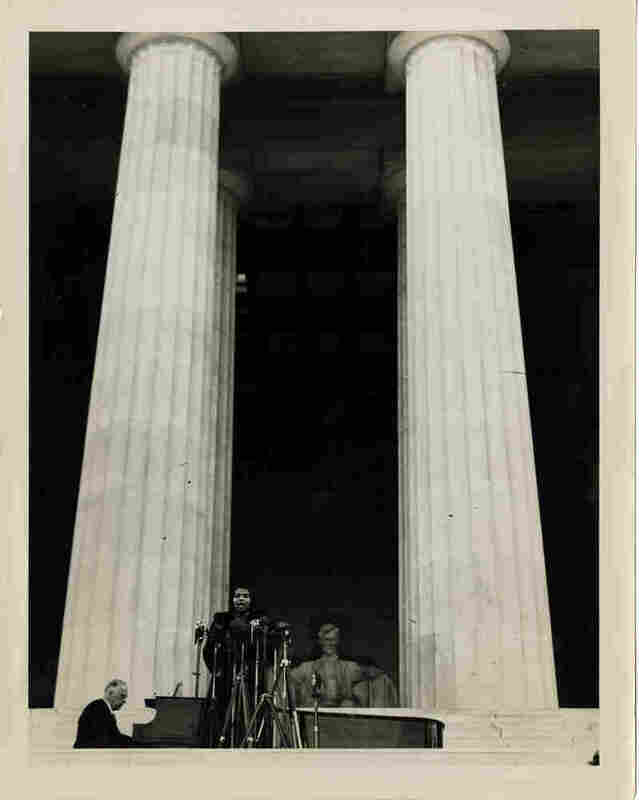 When Ickes introduced Anderson, he told the desegregated crowd — which stretched all the way from the Lincoln Memorial to the Washington Monument — "In this great auditorium under the sky, all of us are free. Genius, like justice, is blind. Genius draws no color lines." 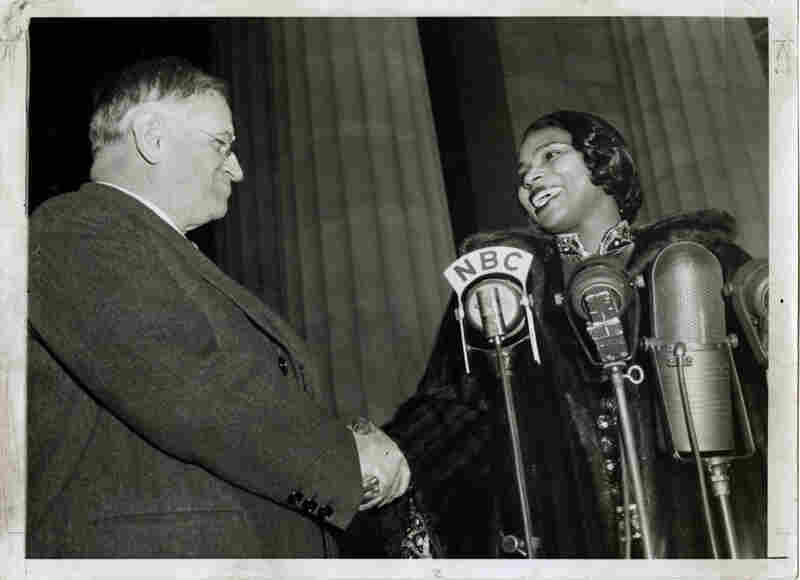 And genius had touched Marian Anderson. Anderson inspired generations and continues to do so. An anniversary concert will take place at Constitution Hall, which denied her 75 years ago. A few featured performers are Jessye Norman, Dionne Warwick, American Idol winner Candice Glover, bass Soloman Howard and soprano Alyson Cambridge. Cambridge first heard about Anderson while she was a young music student in Washington. "They said she was the first African-American to sing at the Met," Cambridge says. At 12 years old, Cambridge was just beginning voice lessons, but she knew that New York's Metropolitan Opera was it for an opera singer. These days, Cambridge finds she has to explain the great singer to others. 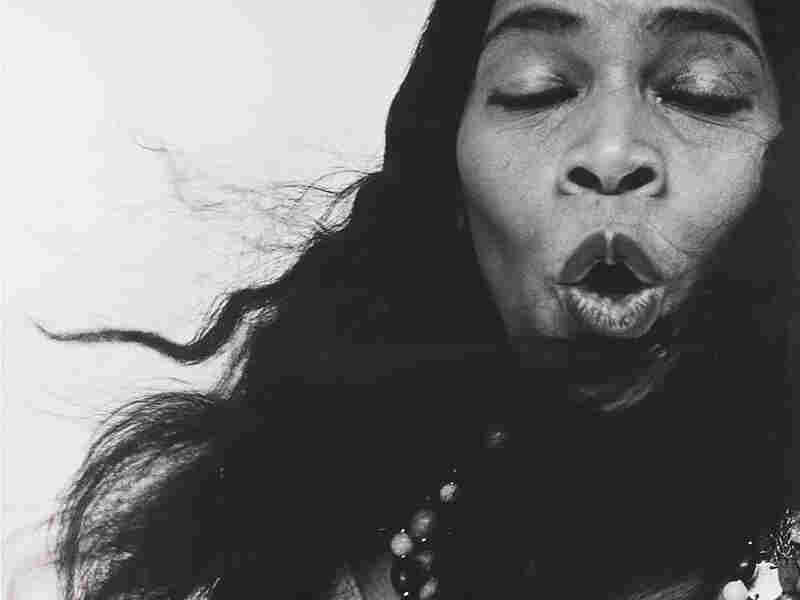 "Some people sort of look at me with a raised eyebrow — 'Who's Marian Anderson?' " Cambridge says. And she continues, "She really broke down the barriers for all African-American artists and performers." The Lincoln Memorial concert made Anderson an international celebrity. It overshadowed the rest of her long life as a performer — she was 96 when she died in 1993. Eventually she did sing at Constitution Hall. By that time, the DAR had apologized and changed its rules. Anderson rarely spoke of that historic April day, and Keiler says when she did, there was no rancor. "You never heard in her voice, a single tone of meanness, bitterness, blame, it was simply lacking," he says. "There is something saintly in that. Something deeply human and good."